Commercial operators make a big deal about power, but when it comes to residential products, you just want something that’s easy to use so you can get lawn chores done as quickly as possible. 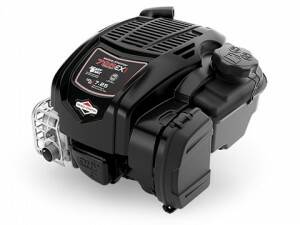 Briggs and Stratton’s EXi motor is built for these owners, eliminating the need for oil changes while making everything from starting to fueling as easy as possible. The EXi uses an overhead valve design that decreases fuel consumption and vibration, making this motor cheap and easy to use. Briggs and Stratton makes three versions producing anywhere from 6.25 to 7.25 lb-ft. of torque, which is par for the course in this market. However, they’re able to deliver that power with less weight than anything in its class at just 17.5 to 18.8 lbs, making whatever equipment it’s mounted in more maneuverable. The onboard fuel tank holds 0.27 gallons of fuel fitted with an angled, oversized filler neck to make it easy to fill without spilling Like other modern small engines, the EXi runs fine on regular gasoline with up to 10% ethanol. The carburetor is made out of an automotive-grade polymer that is corrosion proof and resistant to varnishing, making it a better fit for modern fuel formulations, but the company still recommends using a fuel stabilizer to keep the fuel fresh. There’s no choke or priming bulb on this engine, and Briggs & Stratton guarantees that it will start in two pulls. For this redesign, the company ditched the oil-soaked foam element for a paper element with dual seals. This filter removes finer particles, reducing engine wear while keeping the oil cleaner. The top of the air cleaner box can be removed without tools for quick access when cleaning or replacing the filter. Between improvements in cooling, air filtration, and tolerances, as well as a debris-deflecting filler neck, Briggs & Stratton have designed an engine that can use the same oil its entire life, requiring only occasional checks and top-ups. Regular 5W-30 small engine oil can be used in the EXi, and improvements to the cylinder bore finish and oil control ring greatly reduces oil burning, so oil needs to be added less frequent than older designs. There isn’t much to do on this motor: just check the oil occasionally and replace the air filter and spark plug once a season. Even the gas cap and dipstick are easier to use thanks to a seal design that requires just a quarter turn for removal. Shanks Lawn Equipment has been helping everyone from homeowners to lawn care professionals with their outdoor equipment for over three decades, and as a certified Briggs & Stratton dealer, we have the factory training so you know your motor will be fixed right the first time. Whether you just need some oil or need a complete overhaul, visit our shop, located at 4900 Molly Pitcher Highway in Chambersburg, PA. To get here from I-81, take Exit 10 to Marion. We also ship OEM parts across the U.S. and Canada. To order, visit us at our website, www.shankslawn.com. This entry was posted in Uncategorized and tagged Briggs & Stratton EXi, Engine, Shank's Lawn. Bookmark the permalink.